In addition to a wonderful and delicately fragrant springtime show of snow-white blossoms, apples make attractive landscape trees that offer abundant shade during the summer plus provide you with delicious fresh fruit in the fall with a taste than can't be bought in any store. Apple trees need sunshine for healty growth and to produce fruit. They are not particularly fussy about soil types, but prefer a well drained site that offers sandy loam with a pH around 6.5. 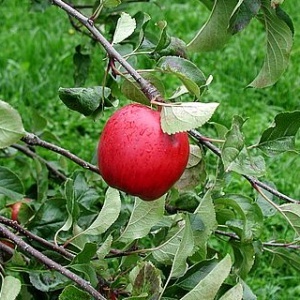 If you expect apples from your trees, you need to plant two different varieties. Your garden center or nursery can advise you which types bloom at the same time and are compatible for pollination. Your trees should be planted at least 8 feet apart - more is better. Some standard trees can attain heights of 20 feet or more at maturity, so it pays to plan ahead. You can purchase dwarf varieties which will get about half as tall and still bear full-size fruit. Also keep in mind, most apples need from 500 to 1000 hours of either continuous or cumulative temperatures below 45 degrees in order to bear fruit. Chilling requirements vary with different species and varieties. There are a some exceptions such as Apple Anna and a few others that have very low chill requirements and are suitable for warmer climates. Young trees under 5 years old should be pruned yearly to obtain and maintain desired form and compact shape. Always prune during the dormant season - usually December through February. When first planting a new one year old tree, which should be done in November or December, cut off the main stem by about 1/2. Be sure there are four or five remaining buds or branches. From then on, the usual practice is to remove 1/3 to 1/2 of the latest growth. Make cuts just above an outward facing bud. Trees that are 5 years or older are considered to be mature and require little if any pruning except to remove dead wood or branches that are too close together. Keep in mind that apples are produced on growth from the previous year. This apple first originated in the early 1960s and has steadily grown in popularity since then. The skin is yellow-green skin with red streaks down the side. The flesh is white, firm and crunchy. A deliciously sweet and flavorful apple. It will begin to ripen in the middle of September, but tastes best if left to fully mature until October or November. The trees set fruit early and in abundance. They are also suitable for pollinating other apples. Gala apples are one of the best tasting apples you can grow. The fruit is medium sized, yellow with a slight touch of red. The yellow flesh is very juicy, firm, crisp, and has a wonderful smell. Trees bear heavily and fruit begins to ripen in late July. This is a table apple, generally not used for cooking. The trees are tolerant of conditions and can grow in wet, dry, and poor soil. The delicious Brae Burn apple is one of the most popular apples in the world. Skin color varies from gold with red streaks to almost completely red. The sweet flesh is white and crisp, aromatic, firm, and juicy and has a slightly tart taste. The medium to large fruit ripens rather late in the season around October or November. Almost everyone knows this large red distinctly heart shaped apple. The yellow flesh is crisp, sweet, juicy, and truly delicious. These apples are grown across the country, and make a wonderful addition in salads. They become ripe in mid to late September. They are best eaten fresh off the tree. The very popular golden delicious apples have a nutty, juicy flavor. Their insides are firm, white, crisp and sweet. The skin is thin and soft and will bruise rather easily. However, they are great for cooking because even when cooked or baked, they retain their wonderful taste and shape. Size and shape is medium to large, very much like the red delicious. The flesh is crisp, juicy, sweet and mild. They ripen about the same time as the red delicious in late September and can last a long time if not bruised. Plant some apple trees. They are a worthwhile investment and will enhance your property. If you don't have enough room for two trees, perhaps your neighbor would be interested in a joint project.